For many the pain and discomfort of living with foot and ankle disorders can seriously affect quality of life, but many people do not realise that either medications, surgery or simply living with it are the only options. 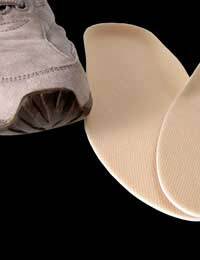 Thousands of people every year benefit from using either an insole or an orthotic device. Insoles are products that can be made from many different substances such as gel, leather or a rubber mix, that aim to act as a cushion, pressure reliving device, to help manage mechanical disorders of the foot or simply act as a moisture absorber. They are commonly used as arch supports for the condition known as flat feet, can help to relieve ankle sprains and strains and to relieve discomfort of corns and calluses.Many sports people benefit from the use of insoles as they act as a shock absorber for high impact sports, or add comfort to long distance running. For everyday use, they are good for amending shoes to fit, particularly if you are a half size; buying the smaller size will only cause problems such as foot ache, corns and calluses, it is much better to buy the slightly larger pair to allow room for foot expansion when they become hot, and because the size can be amended by using a foot insole. There are many different types, each having its own properties and function. They vary in price from retailer to retailer, but if you would like to try an insole for supporting flat feet or another condition, please do speak to a foot health expert in order to ensure purchase of the most effective and appropriate type. Orthotic devices are pieces of equipment designed by professionals, often for the individual, based upon their needs and requirements. There are many different types each aimed at specific problems of the foot, but overall aim to add support and stability for the person. By using an appropriate orthotic device, the person will hopefully experience less pain and discomfort from their condition along with gaining more confidence with mobility as their lower limbs become more stable. The muscles, bones, joints, and tendons of the foot and ankle all benefit from the use of a suitable orthotic device and many conditions can be aided or the severity reduced by their use. Orthotics come in a wide variety of shapes and forms ranging from small shoe inserts to correct foot alignment on a small scale, to larger mechanical devices that aim to support the entire foot and ankle. They can be made from virtually any material such as metal, leather, plastic or even a combination of many substances. Those suffering from arthritic conditions, foot abnormalities and deformities, athletes, those with bunions, corns and calluses or those who simply would like to correct their gait may benefit from the use of an orthotic. Insoles and orthotics are both ways of maintaining the health of your feet and can be extremely useful if the correct type is selected. Always ask for advice from a professional and research your options before making a purchase as the selection available is quite vast and some can be expensive, especially if they are to be custom made.